The quest for high level, wide angle (RC9) photography (and in colour) began, in Adastra's case, in early 1973 following a suggestion from the National Mapping Council, (per Joe Lines). The only 40,000 foot capable aircraft within Adastra's financial reach was the Hawker Siddeley HS125. We requested from Qantas and were given relevant performance figures. We were also able to put the tape measure over a Qantas HS125 with regard to the physical fitting of the RC9 camera, (Jack McDonald, our works manager, in charge). Before the flight I had given the pilot, a young man named Barclay Archbold, our requirements for survey operation - mainly to take-off with full fuel and flight at 40,000 feet true. Before the flight Barclay was straightforward and told us that, under the conditions requested, we would be disappointed with the aircraft's performance. And so it proved to be. The HS125 with full fuel climbed magnificently to 40,000, but as a survey platform at that weight, was hopeless. It actually wallowed. Barclay then agreed to my request and we stooged around until we could ascertain the fuel limitation to enable stable flight at that height. In spite of this setback (we would be losing about 30 minutes duration) it was decided to press on with the investigation. To this end, East-West Airlines, who were about to take-over Adastra, fabricated a light weight pattern of the RC9, and David Ham of Qantas designed a cradle for the camera and its fitment in the rear of the HS125. However, physical problems with the latter continued and Qantas suggested switching to the Boeing 707 for the test programme. David Ham showed that the RC9 could be fitted in a fuselage panel immediately below the cockpit. This panel gave access to a pressurised compartment which could also be reached from the navigator's station, behind the captain's seat. 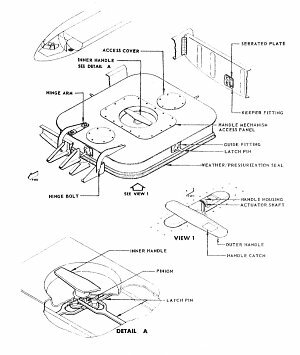 The aircraft chosen for the modification was VH-EAA and the camera installation was made without problem. Our first test took place on 20th December 1973. VH-EAA was on acceptance after a major, and takeoff and landing were both at Mascot. The weather turned sour during the flight and we ended up over 8/8, so my only job was to go through the routine of setting up the camera (i.e. drift, time interval, level) and making sure the on/off was working. This switch operated by way of an extension lead which I held in the cockpit. The flight could have been termed a fizzer but at least the ground work (literally) had been proven, and all we awaited was another opportunity both weather-wise and a suitable VH-EAA flight. Costing, as always, was a major consideration and although N.M.C. maintained their interest, no contract would be made until Adastra had produced a sample run. Chartering a 707 was out of the question, but to help out, Qantas now suggested an economical way of achieving our aim. Periodically EAA ferried crews to Avalon for training and we were offered a block of time during the ferry, for our work at 40,000 feet. However, before a second opportunity arose, EWA, now the owners of Adastra, seemed to lose interest in the project. There was also a further small contretemps in that Adastra and I parted company in May 1974. Lou Pares, our General Manager, was overseas and in his absence, being his deputy, I was in charge, but sadly had a serious run-in with John Riley, the G.M. of EWA. The latter were, no doubt, dab hands at moving passengers and freight around the countryside, but knew precious little about air survey. Anyway, my dispute with their top man was enough to give doubts about the future and I resigned. Pares, on his return, was determined to regenerate the project and asked me to act as standby consultant and navigator. This I agreed to readily, as I was as interested as he. But it was late in the year before the scheme got underway again, and no Qantas ferries coincided with survey weather until January 1975, when the first trial since December 1973 occurred. 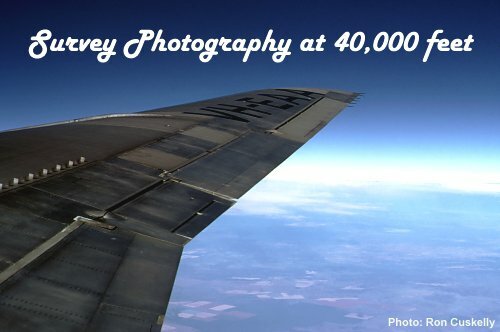 The flight was moderately successful in that we had produced survey photography at 40,000 feet. 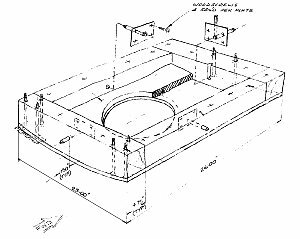 However, the quality of the prints was substandard, and adjustments to aperture, exposure time, filter and camera heating were required. Then over the year another five flights were made with little achieved (mainly due to a series of camera faults or poor weather) until the last on 11th November 1975, when good quality survey photography resulted. My records of the seven sorties are rather scant but below are listed such details as I retained. Sydney to Sydney Nil photography due weather. Sydney to Avalon Encouraging result. Sydney to Avalon Nil photography due weather. Sydney to Avalon Camera u/s. Sydney to Avalon Camera u/s. (Navigator was Lance Nichols. Self in Brisbane). Sydney to Avalon Camera u/s and weather unfavourable. Sydney to Melbourne Survey run over Canberra. (a) VH-EAA took-off with full fuel (an error) and was thus overweight for an Avalon landing, and diverted to Melbourne. 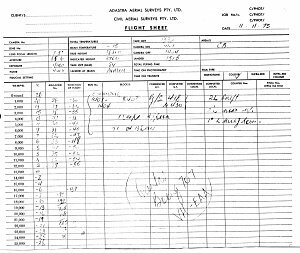 (b) The aircraft weight, combined with ATC requirements, meant we had climbed to only 37,000 feet when Canberra was in view. As Cu was forming, I decided that a photo result was more important than the lower altitude and we moved straight on to the run. (c) The target run included Parliament House, which we crossed at 1400EST, on a day which has gone down as one of infamy in Australia's constitutional history. All our work with its attendant delays and frustrations, was for nought, as shortly after that last and successful flight, satellite imagery became readily available.